The 2019-2020 UW Academy Freshman Application is OPEN! If you have questions about the Academy application process, read the information below and feel free to email us with questions at uwacad@uw.edu. Sign-up here to receive email updates about this year’s 2019-2020 UW Academy Application including information on the application process, announcements about info sessions, and other events designed to help you to learn about early college entrance through the Robinson Center! What is the UW Academy? The UW Academy, created in 2001 in partnership with the University of Washington Honors Program, is an early university admission opportunity for 10th grade students in Washington State. Every year, a small cohort of up to thirty-five academically advanced and highly motivated students are admitted to the UW Academy. Students apply to the program during their 10th grade year, and if accepted, withdraw from high school at the end of 10th grade to enroll as freshmen at the University of Washington. At the Robinson Center, UW Academy students find a community of like-minded peers and an experienced staff who can help them to make the most of their time at the UW. At the University of Washington, UW Academy students participate in the full-range of campus activities and opportunities. Academy students pursue a wide-variety of majors and disciplines in their time at the University of Washington, from Neurobiology to music performance. They also routinely participate in research, take advantage of study abroad opportunities, apply for internships, and seek involvement in student organizations and government. To support these students as they make their way through their college careers, the UW Academy offers a number of Student Support services, including ongoing Academic Advising addressed to their specific needs and Bridge Programming built to ease the transition to college life. The Robinson Center itself is a home base for Academy students on campus. Here, students can meet their peers in the Early Entrance Program and seek out advising from the staff who are on hand to answer their questions and help them to realize their goals. The UW Academy is not a Running Start program. Academy students may not be enrolled simultaneously at high school and at the UW, and Academy students do not earn a high school diploma. This has not hindered Academy students in securing internships or jobs during their university career, nor in gaining admission to graduate or professional schools after graduation. Please see the tabs below for more detailed information about UW Academy programs and services. In being admitted to the UW Academy, students begin their careers as full University of Washington freshmen. In their first year, the UW Academy provides a number of programs built to ease the transition to college life, and to give students the skills they will need to meet their goals once they are there. Like all UW freshmen, Academy students participate in Summer Advising and Orientation Sessions, where they are introduced to campus resources, learn about undergraduate requirements, and register for their first classes. During this time, the UW Academy supplements their experience with group advising sessions, and works with First Year Programs to help students plan out their first quarter. UW Freshman Orientations usually take place during early July. The Academy begins in earnest with the Bridge Program, which is designed to ease the transition from 10th grade to university. Bridge begins with Academy Camp, an overnight retreat to Camp Indianola in mid-September where students meet members of their cohort, older Academy students, and UW Academy staff. In the days following camp, students attend workshops on college success skills led by Academy staff and students. Bridge continues into Fall Quarter with two required Academy courses: ACAD197 and ENG199. ACAD197 is a weekly seminar, designed specifically for Academy students, that introduces interdisciplinary thinking in the sciences and university-level coursework. Linked to this course, ENG199 introduces students to the standards of college composition, giving them an opportunity to hone the skills they will need to succeed in many of their undergraduate classes. The goal of the Academy courses is to provide students with a common experience and an opportunity to bond as a group while also helping them to develop college-level writing, reading, and discussion skills. The professors who teach the Academy classes enjoy working with bright young students, and they work closely with Academy staff to understand students’ needs and requirements. In the Winter, students have the option to enroll in ACAD198, a weekly seminar designed to help them “make the most” of their university experience. In this graded course, taught by the Academy Director, students are given the opportunity to investigate potential majors in a structured environment amongst their peers. They learn about campus resource centers and opportunities such as undergraduate research and international study. They also work with their instructors to craft personal statements and resumes which will help them to apply for these opportunities in the future. Academy students have regular required advising appointments with the Robinson Center’s Academic Counselor throughout their first and second years at the UW. In addition, social programming is offered to encourage community both within the first year cohort and among Academy cohorts. See more about our Advising program in the tab below. The UW Academy has a unique relationship with the UW Honors Program, which provides three distinct Honors degree options for UW — and Academy — students. We encourage all students to determine for themselves which, if any, Honors track is the best “fit” for them and their interests, and to make the decision to apply with a full understanding of their options. Both Robinson Center and Honors Program advisers are available to help students navigate these choices. The first Honors degree option is Interdisciplinary Honors, a general education Honors track. Rather than simply offering more difficult coursework for highly motivated students, Interdisciplinary Honors provides students a unique liberal arts experience which emphasizes interdisciplinary thinking, experiential learning, and reflection. In their first year, Academy students are given the opportunity to sample the multi-disciplinary seminar-style courses offered through the Interdisciplinary Honors Program. At the end of their first year, Academy students who have taken Honors courses and wish to continue with Interdisciplinary Honors may apply to the Program via special application process built for Academy students. Many of our students also decide to pursue a second Honors track – Departmental Honors – which they apply for once they have declared their majors in their second or third year. Departmental Honors offers an enhanced academic experience within individual fields of study, and for many of our Academy students, this is more in line with their educational preferences. The third Honors option available to Academy students is College Honors, which is the completion of both Interdisciplinary Honors and Departmental Honors requirements. Academy students may also be able to take certain Honors courses without being a member of an Honors Program, which is a great opportunity for students who are looking for advanced, rigorous coursework in one particular discipline but aren’t interested in completing an entire Honors curriculum. For more information about the Honors Program at the University of Washington, check out their website. Check the tabs below for more information on these aspects of the UW Academy. The UW Academy offers academic advising services that are built to serve the specific needs of its early entrance students. The Academy Student Services Team is always available to answer student questions and provide guidance as they navigate the University of Washington. In addition to this, the Academy employs a proactive advising model. Academy students will have regular required meetings with an academic adviser during their first and second years. In these sessions, students can look forward to individualized attention from an experienced academic adviser who is familiar with the resources and opportunities of the UW, as well as the challenges of being an early entrance student. The Advising staff helps students to connect to campus resources and offers guidance in applying to majors. This specialized academic advising is one of the most important resources that we offer to our students in their time at the university. At the Academy, we realize that early college entrance is a transition for the whole family. With this in mind, the Academy holds several Parent Check-In events over the course of the year, where the parents of our students can maintain a dialogue with staff and receive important information regarding university policies and opportunities. Of course, the staff is always on hand to talk with families about their concerns on a case by case basis as well. The success of the UW Academy Program depends on the active participation of students during our Bridge Programs and other services. Older Academy students return to provide guidance and practical advice to newer cohorts as Teaching Assistants and Camp Counselors, and they volunteer to serve on panels during Bridge and other informational sessions. In addition, the students themselves administer a number of programs designed to welcome new students, incorporate them into the larger RC community, and give them resources amongst their peers that they can turn to for advice and questions. The Academy Peer Mentor Program pairs experienced Academy students with members of our incoming class, and coordinates a number of social events throughout the academic year. Other RC student organizations, like the EEP/ACAD Drama Society, invite participation from Academy students and engage the whole RC community with cultural events and celebrations of student talent. The UW Academy accepts applications from students who are currently enrolled in the 10th grade. Applicants must supply an official High School transcript which includes first semester grades from their 10th grade year. We are unable to consider applications from students in the 9th or 11th grade. Out of State Students: The UW Academy does consider out-of-state students for admission, though these students will have to pay Non-Resident tuition for some of their time at the University of Washington (see below). International Students: Our mission is to admit and support motivated, highly-capable students seeking early entrance to the UW, and we welcome applications from international students who fit this profile. But because of the unique nature of the early entrance programs housed in the Robinson Center, only students with particular types of international visas will qualify to apply. Since our students enter the university in a non-traditional way, we are, in some cases, restricted by law and are unable to admit students who are supported by particular visa types. In addition, students with applicable visas must submit evidence of their language proficiency alongside their application. For more information, read our International Student Policy. Undocumented students: The Robinson Center and the University of Washington welcome applications from undocumented students. To learn more about applying, please consult the UW’s Undocumented Student Resource page. Admission to the UW Academy is competitive. We look for students who love to learn, who actively seek out academic challenges, and who have the personal maturity to succeed in the university two years early. While there is no minimum high school GPA or test score required to apply to the UW Academy, admitted students tend to have excellent test scores and grades. For the incoming class of 2017, the average ACT composite was 32 (range of 25-35), the average SAT score (on the new system) was 1455 (range 1230-1550), and the average high school GPA was 3.96 (range of 3.75-4.00). That said, the Academy employs a holistic admissions model. This means that we carefully evaluate all elements of an applicant’s admission file (not just grades and tests) to determine whether the Academy and the UW are the right educational match for him or her. Unique educational experiences, service, goals, or other non-academic strengths will also be considered in our admissions decisions. We recognize that deciding to leave high school to come to college early is a big decision, one which must be carefully considered by both students and their families. To this end, we provide multiple opportunities for interested parties to investigate the Robinson Center and the UW Academy program prior to applying, and even after they have been formally accepted. We want all of our students to be able to make informed decisions about early entrance and to have the chance to ask themselves whether the UW Academy is the right fit for them! 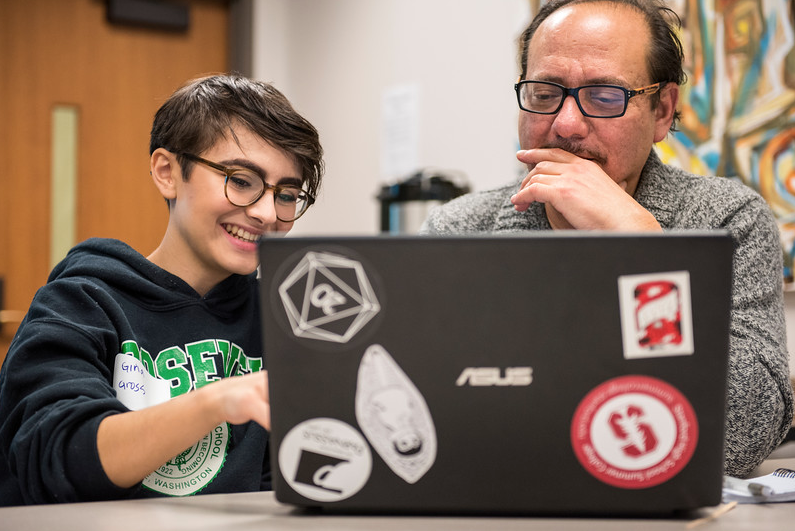 Students and families who are interested in learning more about the program and who would like to meet the staff and students firsthand are invited to attend one of several Information Sessions, held both on campus and in locations across Seattle. Here, students and families can learn about the program ask questions of both UW Academy staff and current students. Dates for these information Sessions will be posted in early Fall. Prospective students are also encouraged to sign up for a UW Academy Visit Day, where they will be allowed to meet and ask questions of Academy staff in a more intimate environment, take a campus tour, and sit in on UW classes. Visit Days occur throughout late January and early February, and priority will be given to current 10th graders. Registration for these Visit Days typically opens in early January. Once the application process is complete, admitted students will have another chance to consider whether the UW is the right fit. During Experience Days in mid-May, students will shadow a current Academy student, meet with the Director of the Program, and get a chance to see what “a day in the life of an Academy student” is like. Admitted students will be contacted to participate in Experience Days when they receive their decision letters. Academy students pay regular UW tuition and fees directly to the University like all other UW students. And they are eligible for financial aid like all UW students. FAFSA (Free Application for Federal Student Aid) forms should be submitted by mid-February in order for students to be eligible for the maximum amount of financial aid for the following academic year. Academy applicants are automatically considered for a handful of merit-based scholarships offered by the UW Honors Program and the Mary Gates Scholars Program. Though the complete application for the UW Academy is not due until March, there are a couple of tasks that prospective students and families should complete much earlier, in January. We recommend that all prospective applicants complete these tasks as soon as possible, even if you are not totally sure if the UW Academy is right for you. All prospective students planning on exploring financial aid should submit a FAFSA (Free Application for Federal Student Aid). Submitting by the UW’s priority deadline date helps to insure that you are eligible for the maximum amount of aid (and doesn’t hurt you at all if you don’t end up applying). This deadline is typically in early-mid January. For the exact deadline, and for more information on this process, please go the the UW Financial Aid website. The FAFSA not only helps to secure federally subsidized grants and loans to help fund your education, but it is also required in some outside scholarships as well (including the UW Academy need-based scholarships). Students always have the option to refuse any aid that is offered after filing. You do not have to have completed your annual tax return in order to complete the application. To find the application, go to https://fafsa.ed.gov. The UW’s school code is 003798. Students applying for the UW Academy are required to take either the SAT or the ACT Exam as a part of their application. The optional essay portion of these exams is not required. Be aware, these exams are only administered on certain dates during the year, and you must register for them at least a month in advance. You must take your test prior to the end of February, or your scores will not be published in time for us to consider your application complete. If you are considering applying for the UW Academy, we recommend that you register for a test date ASAP! Register for the ACT here or register for the SAT here. For the ACT, please send to scores to both UW (4484) and to the Robinson Center (9899). For the SAT, please send to scores to both UW (4854) and to the Robinson Center (9899). STEP 2: Submit applications materials (paper copies) to the Robinson Center. You can access and download these application materials below. These written materials include the UW Freshman Application, written components of the UW Application (including the UW Academy Essay), and your unofficial transcript. Both of these steps must be completed by 4:30 PM on Monday, March 4th, 2019. Please complete the online component and then compile and submit paper application materials in one packet to be dropped off or sent directly to the UW Academy at the Robinson Center for Young Scholars. If submitting these material by mail, please send them so that they will arrive by the deadline. One of my teachers hasn’t filled out their recommendations for me yet and I’m worried they won’t finish in time. You should receive an email every time a teacher finishes a recommendation for you, so make sure you have received emails regarding all of your recommenders. If you have not, politely remind them about their recommendation and about the due date of the application. If your recommender needs our email prompt resent to them, contact us at uwacad@uw.edu or 206-616-0561. I’m having trouble logging in to my online application. What do I do? Call our Student Services Team at the contact information above to reset your password. DO NOT make a second account because that will make reviewing your application very confusing, and could result in us marking your application as incomplete. I haven’t taken the SAT/ACT yet. How should I fill out the Test Scores section of the online application? Make sure to put your test date in the date field, and then put zeroes or ones in the Scores fields. We will match up your scores with your application when we receive them. How do I enter my grades in the 7/8th grade coursework section of the UW application? Is it required? There’s not enough space! If you took classes in middle school that you received high school credit for, then this section is required. You may have to contact your middle school for a transcript or grade report in order to fill it out. We understand that there is not enough room to put in semester grades, so please just summarize your grades and classes as best you can. For my high school grades, what do I put in the course notation column? In this section, the only notation we are concerned with is whether the class is Honors, AP, IB, or some other notation related to advanced coursework. Other than that, you can leave this column blank. I am an undocumented student. Am I eligible to apply? The writing section of the application refers to an attached “Activity Grid” but I can’t find it! The grid referenced on the last page of the UW application does not actually exist in this printed version. Please make your own table, or list out your activities with a short paragraph about each. I already paid my Academy application fee, but the online application is telling me I still have a $60 balance. What’s going on? This is an occasional bug in our application system. Call the Robinson Center (RC Main: 206-543-4160) and we will fix the issue. When can I drop off my application in person? Who should I hand it to? Your application can be dropped off at the Robinson Center anytime between 8am and 4:30pm. You should hand it to the receptionist, or any member of the RC Student Services Team. The person at the front desk can direct you. Your application must arrive at the RC by the application deadline. Within one week of the application deadline, applicants will be notified by email that their complete application has been received. Decision letters will be mailed approximately six weeks after the application deadline. Please note that due to the volume of applications, we are unable to speak with applicants about the standing of applications during the admissions process. Each year, approximately thirty-five students are accepted into the UW Academy. In addition, several applicants are offered a spot on a wait list. Before making their decisions about whether to join the Academy, accepted students attend events during Academy Experience Week. During this time, accepted students are paired with a current Academy student for a “day-in-the-life” experience. Accepted students also have an individual meeting with an Academy staff member. Academy Experience Week kicks off with an evening informational meeting for accepted students and their families. The Academy cohort is usually set by the end of May. A reception welcoming new students and their families is held in mid-June, followed by a parent orientation for parents and guardians of incoming Academy students. At the conclusion of 10th grade, Academy students request final transcripts from their schools, withdraw from high school, and enroll as full-time freshmen in the Honors Program for the following Fall. Please note: all students admitted to the UW Academy will have REQUIRED Academy and UW academic counseling, orientation programming, and Autumn quarter registration workshops through mid-July, as well as bridge programming starting in mid-September. A calendar with more specific dates will be made available to students in May, once admission decisions are finalized. Please keep this in mind when making summer vacation plans. Applicants who are admitted and who confirm their intention to enroll at the UW through the Academy will be required to send a final high school transcript that includes second semester of the 10th grade year. Final transcripts should be submitted as soon as the spring term of the sophomore year is complete and coursework and grades have been recorded on the transcript(s), but no later than July 1. ￼The UW Academy staff will verify that all admission requirements have been satisfied, and the offer of admission can withdrawn if important discrepancies are discovered. All applicants are allotted one opportunity to appeal the decision of the application committee. Any denied applicant may appeal. Applicants that are waitlisted have not been formally denied and cannot appeal their position on the waitlist. They are eligible to appeal if they are denied after the waitlist period has expired. Generally, applicants petition if they believe their academic or personal circumstances could not be considered adequately through the standard admission review process or that an error occurred in the application review. All appeals must be received within two weeks of the Academy’s admission decision. All students can view the current status of their application to the UW Academy by logging into their account on the RC website and clicking “View Applications” on the left column menu. When an application is officially denied, the application status will reflect this change and offer applicants a new link which they can follow to appeal the decision. Clicking on the “appeal” link will bring up a page where applicants can describe their appeal and upload up to three documents that contribute to the case they are presenting to the admission committee. We recommend preparing these materials prior to clicking the link. All appeals must include a formal appeal letter (no more than 3 types pages), composed by the student applicant, which presents a clear and concise explanation of the applicant’s reasons for seeking reconsideration. Applicants should keep in mind that the application committee has already reviewed the original application. Typically, appeals present new information about the applicant or seek to provide additional explanation about aspects of the academic record that are not as strong, including information about circumstances and hardships, such as personal or family illness, factors related to a disability, or familial or cultural barriers that may have affected the applicant’s academic performance and record. Appeal letters should clearly explain why the applicant thinks they are a good candidate for the UW and why they are in need of the highly accelerated education offered by the UW Academy. Additionally, appeals may include (but do not require) supporting materials like updated transcripts, additional letters of support, or other documentation of the student’s experience. What is the process for considering appeals? All appeals are considered by the Robinson Center admission committee, which will reconsider each case and make initial decisions based on the information provided. If the RC admission committee decides not to support the appeal, it will be taken to the Office of the Dean of Undergraduate Academic Affairs, where it will be considered again from a different angle. Final decisions will come from Dean’s Office, approximately two weeks after the appeal was received. UW Academy 2019-20 Freshman Application is now OPEN!